One of the biggest considerations when purchasing an outdoor product is the choice of material. Every Yardistry product is built with 100% premium Cedar (Cunninghamia Lanceolata) Lumber giving your Yardistry product a distinctive, premium look and feel. With its natural beauty and outstanding physical properties, Cedar Lumber is the preferred choice for outdoor projects and considered a premium material. The ability of Cedar to bring warmth and character to a backyard project just can't be matched by plastic or other man-made materials. Cedar contains natural preservatives that help it resist decay. At our factory we have also applied a water based stain that has been formulated with ingredients that are safe for the environment. Some of our customers ask why Cedar Lumber feels lighter. There are two reasons for this. Firstly, Cedar is a soft wood so it is naturally lighter when compared to hardwoods. 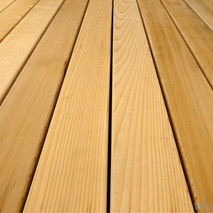 However, the primary reason is that the Cedar in your Yardistry product has been Kiln Dried. Kiln Drying is a process where the Cedar Lumber is put into a giant oven over a period of several days, removing moisture from the lumber. This makes the lumber more dimensionally stable so the wood will stay flat and straight, making it perfect for building an outdoor project.